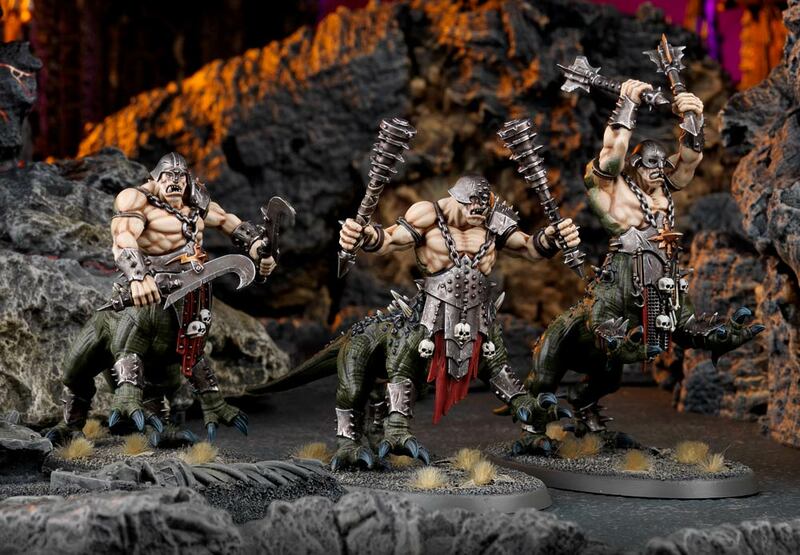 The Beasts of Chaos Battletome is out for Pre-Order now, and with it you’ll find the rampaging hordes of the True Children of Chaos. Unleash a torrent of destructive power with the Thunderscorn, who are capable of taking down an entire flank on a decent charge. 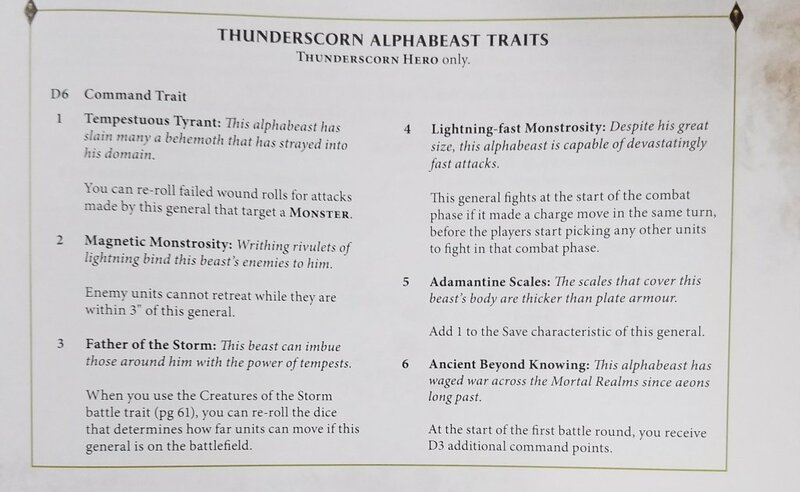 Doubly so if you take a Thunderscorn Hero outfitted with magical artifacts of power and leadership (or Alphabeast) traits. Here’s a look at what’s available to them. You get a few solid traits to start building with. Lightning-fast Monstrosity means you’ll always hit first–but even more firster than first, you go before players even start picking, which means if you have initiative and a lightning-fast beast, you can potentially get off two combats in a row before the enemy has a chance to swing back. Magnetic Monstrosity turns your general into an inescapable tarpit from whence there is no return. So, lots of different ways to play them out, especially once you start bringing in magical items. Horn of the Tempest is pretty amazing on any Thunderscorn, but slap that on a Dragon Ogor Shaggoth and lead a bunch of your fellows into battle and you’re shaping up to be pretty brutal. And Tanglehorn Familiars can be utterly devastating if your opponent is reliant on magic to accomplish anything. Couple that with the Magnetic one, or Father of the Storms and dash around the battlefield ruining mages’ days. Or take Thunderstrike Lodestone for a little extra resilience and a mortal wound here and there, which could potentially wipe out some of the lesser units. Though it’s hard to go wrong with Lightning-chained Bracers–they’ll help your devastating attacks land just a little more regularly, rerolling 1s on all attacks. 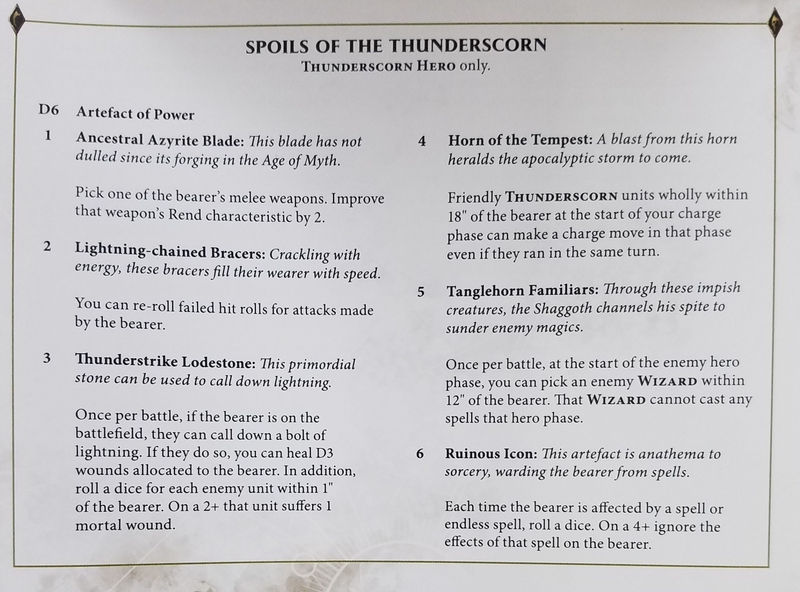 At any rate, those are the Thunderscorn. Stay tuned to find out what other beasts lurk within the pages of Battletome: Beasts of Chaos!